TAYLOR, TX — If you have ever craved the chance to compare what Lockhart’s Original Black’s Barbecue conjures up to the meat by Taylor’s Louie Mueller’s, then sample Fort Worth’s legendary Riscky’s BBQ and Houston’s innovative Pappa Charlie’s BBQ all right next to each other, well, that opportunity is nigh. 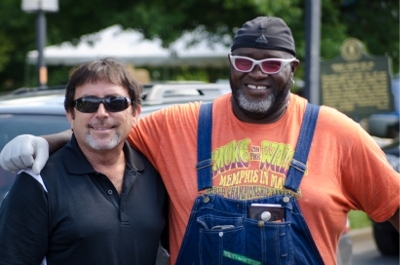 The Taylor Stomp’n’Holler BBQ and Music Festival will showcase 10 of the state’s top professional barbecue Pit Masters June 3 on the city’s Heritage Square. 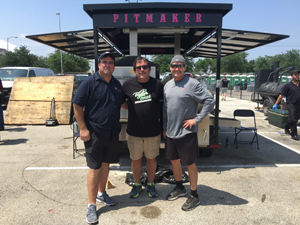 “When we say we have 10 of the top Pit Masters in Texas, it’s the same as saying we have 10 of the top Pit Masters in the world,” bragged Tim Mikeska. 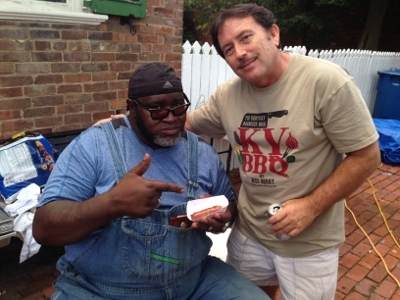 Mikeska, a barbecue legend in his own right, is the Que Guru responsible for recruiting the Pit Masters appearing at Taylor Stomp’nHoller. 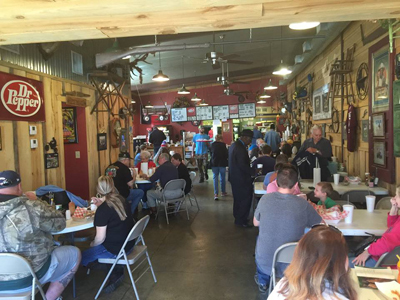 “Folks don’t often have the chance to sample the caliber of barbecue we’ll have in Taylor the first Saturday in June. This is gonna be a treat.” If the piles of pit-smoked meat isn’t enough to entice you, the evening will be capped with a performance by the Grammy and multiple CMA award-winning band, #TheMavericks! This band’s new album, A New Day, is on top of the Americana charts and is tearing up the airwaves. They will kick off at 8 p.m. Opening for The Mavericks will be Rosie Flores, the Rockabilly Filly, and the bluegrass stylings of Whisky Shivers. Both bands are known for their high-energy performances and will set the stage perfectly for The Mavericks. There will be plenty of ice cold Shiner Beer, Mike’s Hard Lemonade and Topo Chico on hand to help wash down the incredible array of smoked meats the Pit Masters will have available. All three levels of tickets are still available. 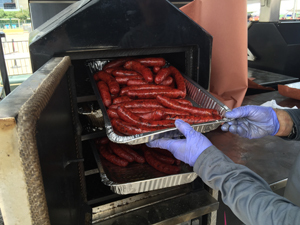 For $100 each, Holy Smoker VIP ticket holders will enjoy the best barbecue ever tasted beginning at 2 p.m. Saturday -- an hour earlier than regular ticket holders. 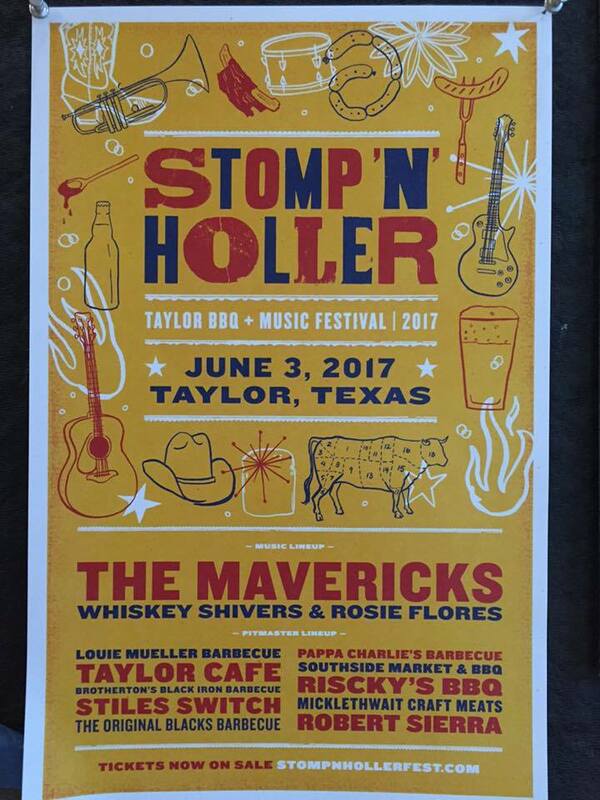 Each VIP ticket holder will receive a limited-edition Stomp ’n’ Holler 2017 t-shirt, coupons for two free beverages and access to the VIP area and standing room only section in front of the stage for the concert. VIP ticket holders will also have shortened beer lines throughout the festival and dedicated porta-potties. These are not insignificant perks and only 500 of these tickets will be sold. At press time, only 250 of these tickets remained. Combo Platter ticket holders pay $65 and get to enter the festival grounds at 3 p.m. 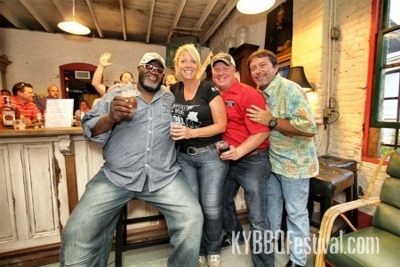 These ticket holders will barbecue from the revered Stomp’n’Holler Pit Masters and experience all of the live music. Concert-only prices are $35 per ticket and only 1,250 of these will be available. The web site calls these Closet Vegetarians because, well, these ticket holders care more about the music than the barbecue. 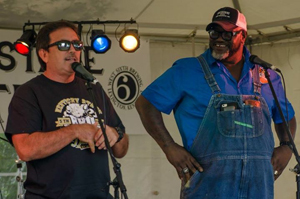 Many of the Stomp’n’Holler Pit Masters have said they will hang around and sell so concert-only ticket holders should be able to buy some award-winning barbecue but there are no guarantees — except that Shiner and Mike’s Hard Lemonade will be available all night long. Stomp 'n Holler! from Rey Barrera on Vimeo. Wichita Packing moved into their new state of the art facility and Tim Mikeska was honored to tour his distributors new headquarters. 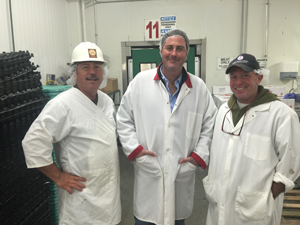 Tim was accompanied by 17th Street Barbecue's Mike Mills and was greeted by Mark Guon and Andrew Bloom who took everyone on a detailed tour of this amazing USDA Plant. If you are interested in using Mikeska Brand Sausage, Wichita Packing is the main distributor in the Midwest and east coast. without a doubt, Wichita Packing has the BEST Pork Ribs... any size and any particular rib. Best in the USA! 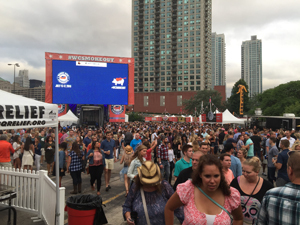 "One of the best events I have ever been a part of...." Tim Mikeska stated after a week spent in Chicago at the Windy City Smokeout. 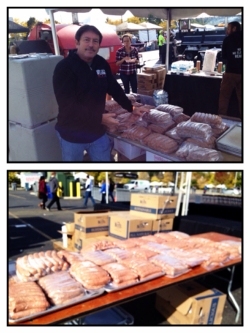 Mikeska Brands was on hand to support their #1 customer, Smoque BBQ. 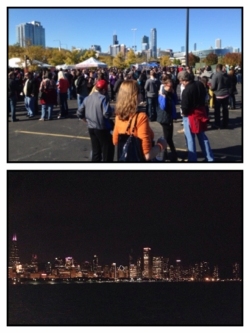 40,000 + guests enjoyed some of Chicago's best BBQ along with Pitmasters from all over the USA. 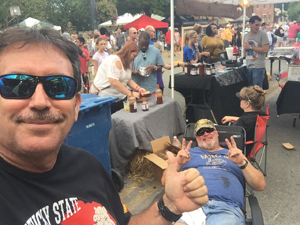 3 days of amazing food and country music.... Tim stated.." it was great to reconnect with so many of my friends from across the USA" Carey Bringle from Nashville, the Legend Mike Mills from Murphyressboro, Barry Sorkin's Smoque BBQ, and Leslie Roark Scott with Ubons BBQ. 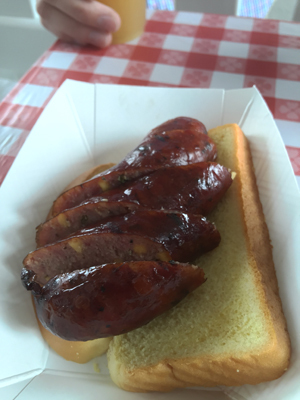 Lots of Mikeska Brands Spicy Smoked Pork Sausage with Jalapeno and Cheese was served by Smoque BBQ. 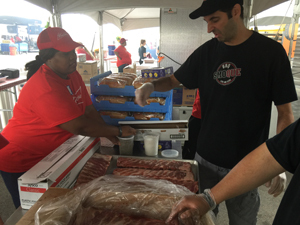 Barry Sorkin with Smoque BBQ working his magic on some amazing pork ribs ! 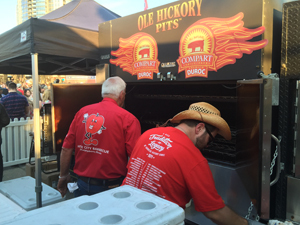 2500 guests and 26 Pitmasters at NRG Stadium was the place to be on a warm day in downtown Houston. 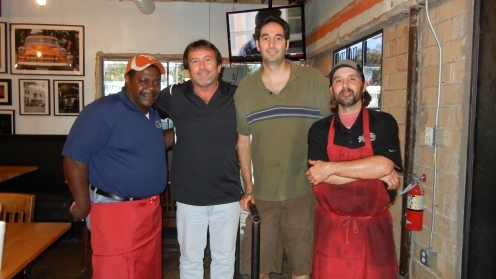 Tim Mikeska was there to support his customer Wesley Jurena with Pappa Charlies BBQ. 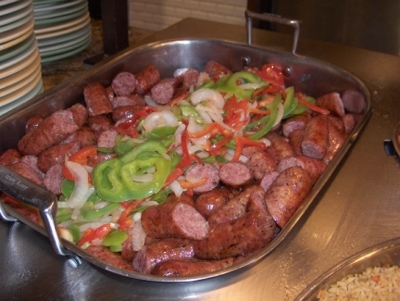 Mikeska Brands Spicy Beef Sausage was served to the VIP guests and general admission. A great day with some of the best BBQ in Texas. Don't miss the 2017 Houston Barbecue Festival ! 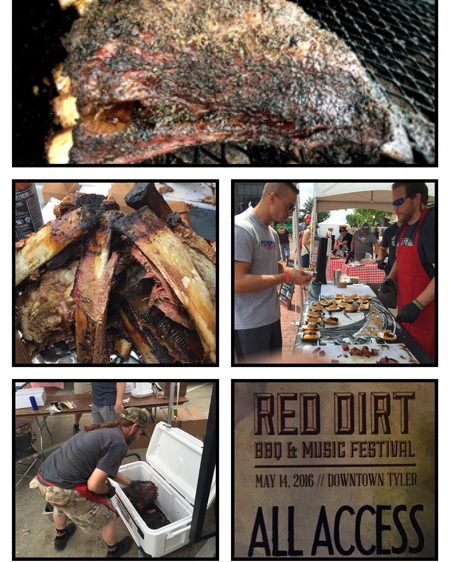 6,000 guests and 20 of the best Texas BBQ Pitmasters were on hand at the 2016 Red Dirt BBQ and Music Festival. 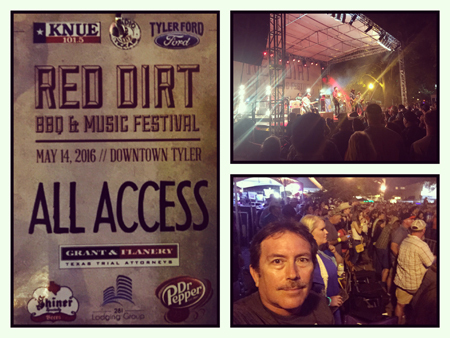 A day of eating and drinking some of the best Texas has to offer was followed by an evening of top notch live music. 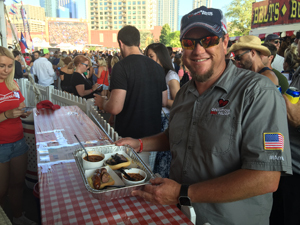 Tim Mikeska was honored to be able to media rep Mikeska Brands and perform interviews with all of the Red Dirt BBQ Pitmasters. The Pitmaster interviews will be live in March on Mikeska Brands YouTube Channel. Don't miss these interviews and make sure you get your tickets to the 2017 Red Dirt BBQ and Music Festival. This may have been the 1st air-conditioned BBQ restaurant in the U.S.
After a few months of distribution issues, Mikeska Brands is back in New York! Desperado's Barbecue in Angola New York is well known throughout upstate New York for its great Barbecue. 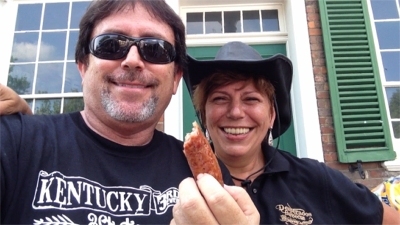 Pitmaster, Shelly Frisch Hunt is a well respected business owner and a good friend of Tim Mikeska. After determining the 1,600 mile distance was too far for the company airplane, Hot Gut One, we used the old dependable standby of Southwest Airlines Air Cargo. Since 2005, Mikeska Brands has partnered with Southwest Airlines as a mainstay for dependable shipping for "product on demand." 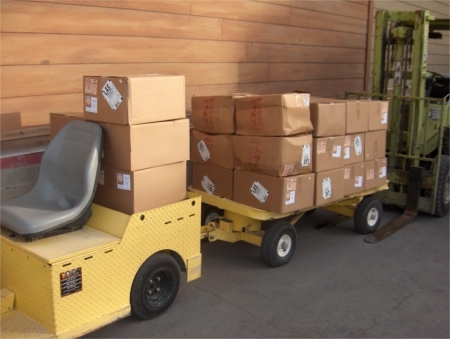 Our main distribution point in Chicago is still used for our heavy 18 wheeled refrigerated loads sent by pallet. Desperado's has been a customer of Mikeska Brands for 5 years and we are thrilled to be back in New York. 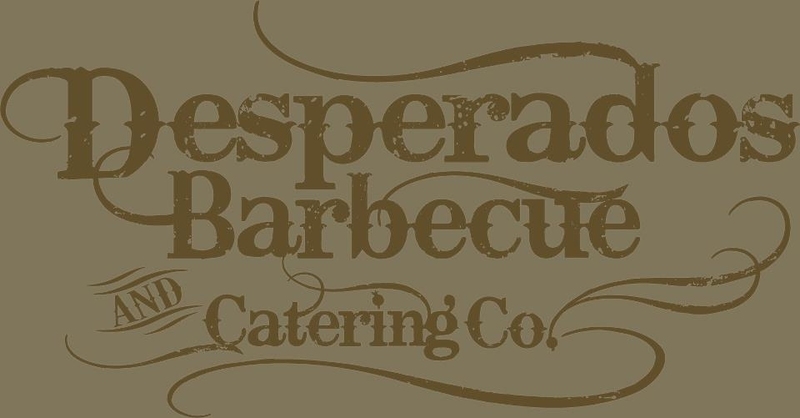 For more about Desperados Barbecue please click here! Mikeska Brands has used many different aircraft to achieve our missions of providing the best in customer service and product on demand all across the U.S. From the Mooney M-20G, Mooney 201, Cessna P-210 and our trusty "Hot Gut One" Cessna Skyhawk II. Now we are expanding our capability with a Beechcraft 1900. Based on the famous King Air, the Beechcraft 1900 is a pressurized, 19 passenger turbo prop aircraft. This aircraft has a range of over 1,400 nautical miles at over 300 miles an hour. The useful load is over 6,500 lbs. 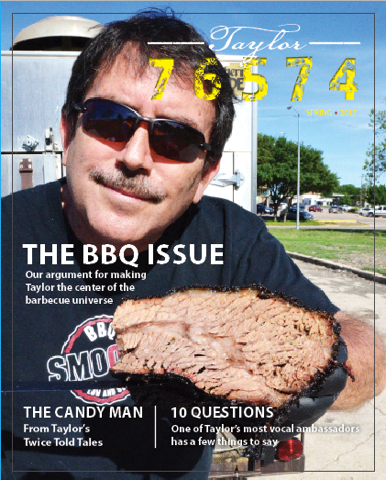 at Joseph's Riverport Barbecue "Texas Monthly's Top 50"
Stephen Joseph is an accomplished Pitmaster from East Texas. 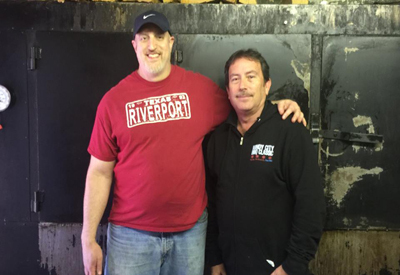 For the last 20+ years he has honed his skills as a Pitmaster making Riverport Barbecue a true food destination. 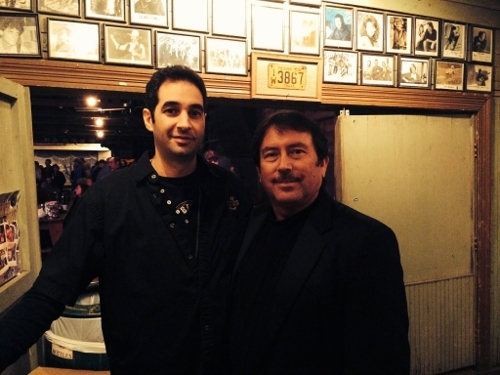 He has taken his business to the highest standards making Texas Monthly's Top 50 BBQ in Texas. 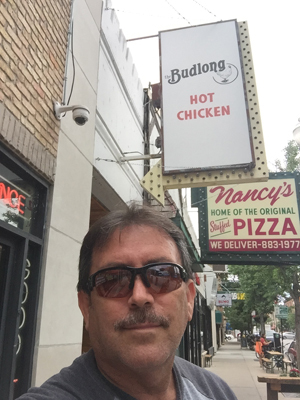 Mikeska Brands is very proud to have our Spicy Pork Sausage and w/jalapeno and cheddar cheese in his famed establishment. 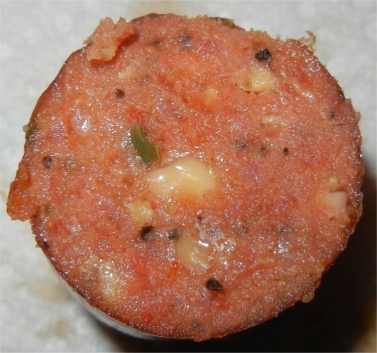 Hot Gut One is flying in fresh sausage to Stephen so all of his East Texas customers can enjoy our fresh product. Our sincerest thanks to Stephen for allowing us to serve him. Riverport Barbecue is a great place... plenty of room and some amazing BBQ !! 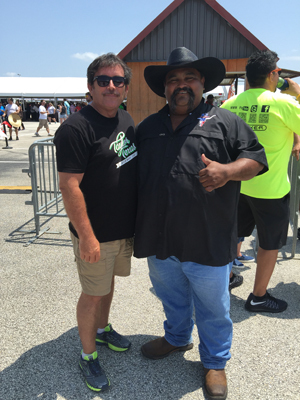 Stephen Joseph, Pitmaster and one of the Texas Monthly Top 50 !!!! Hot Gut One.... loaded and ready to fly ! at acclaimed Pappa Charlies Barbeque in downtown Houston Texas! 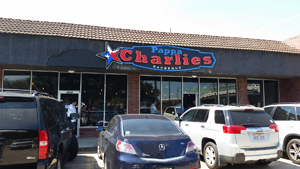 Mikeska Brands is excited to announce that our Mikeska Brands Spicy Pork Sausage and Spicy Sausage with Jalapenos and Cheddar Cheese is now available at the popular Pappa Charlies Barbeque at 2012 Rusk in downtown Houston. A great location for BBQ ! Next to the Astros Minute Maid Park, the Rockets Toyota Stadium and the Brown Convention Center! 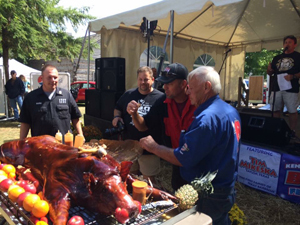 Wesley Jurena has been an acclaimed competition pitmaster for some time, racking up a whole host of competitions and trophies. Wesley has now focused his skill in his new location downtown. Tim Mikeska states.. " Wesley makes some great BBQ. He sources his meat from the famed 44 Farms in Cameron Texas. His brisket and burnt ends are fantastic. I immediately could tell his pork ribs were competition grade... I can understand his competitive cookoffs won by the quality of his food. I am honored to have our sausage at Pappa Charlies Barbeque !" Through our main Chicago Distributor, Wichita Packing Company, Mikeska Brands is now available nationally with US Foods and SYSCO Foodservice. 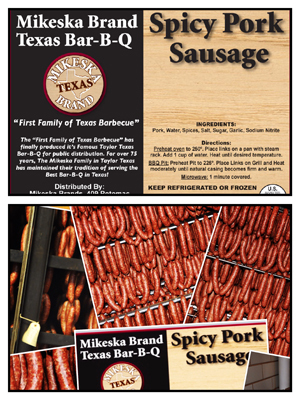 Any restaurant can request our Mikeska Brands Texas Sausage with the following product codes. Tim Mikeska was fortunate to return to Danville Kentucky for the 3rd time in the 5 year history of Kentucky State BBQ Festival. This time Tim was moved from the Demo Stage to the Main Stage as Emcee. 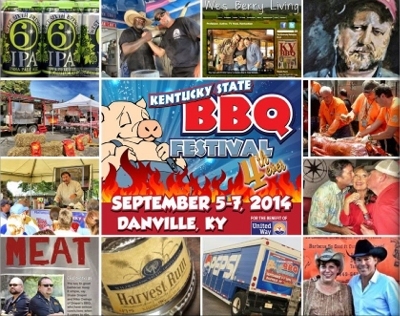 3 beautiful days of amazing BBQ from Pitmasters from all over the country. 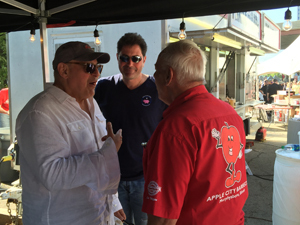 Tim also judged the Baron and Baroness of the Backyard BBQ competition with Wes Berry Phd and author of the Kentucky BBQ Book, and The Legend Mike Mills, one of the winningest men in competitive BBQ and owner of 17th Street BBQ... and his Pitmaster Phillip Heern. 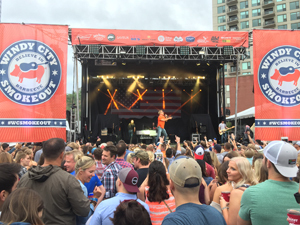 An estimated 30,000 guests enjoyed this event that was highlighted with some amazing BBQ from some of the best Pitmasters in the country and some great blues, rock, bluegrass, and country music. on the main stage with Brad Simmons, founder.. watching Mike Mill's Whole Hog Demo......Judging some great BBQ Ribs with some Legends ! this is my Texas Sausage, there are many like it but this one is mine!.... great Brisket from Lucky Dog BBQ.... always an honor to be with Big Moe Cason ! 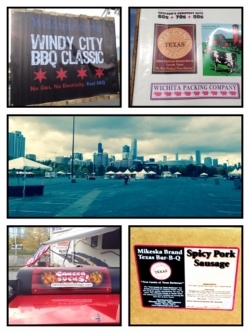 Soldier Field on the beautiful lakefront in Chicago was the scene of the 3rd annual Windy City BBQ Classic. 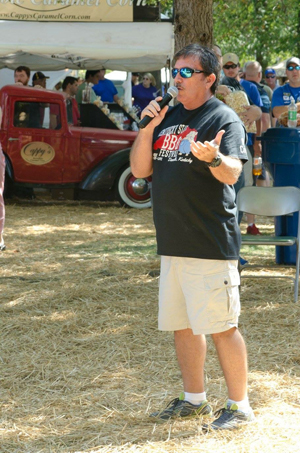 Tim Mikeska took the stage and talked BBQ for the thousands of guests in attendance. 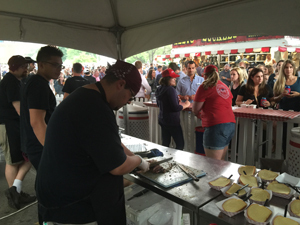 Some of the best restaurants in Chicago were present allowing for guests to have some amazing food samples.. Included were Mikeska Brands customers, Smoque BBQ, Rub's Backcountry Smokehouse and Barn and Company. 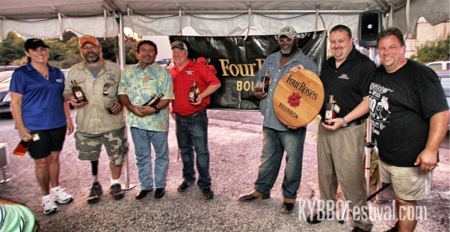 The Classic featured a cookoff that awarded prizes and cash to the best in Ribs, Pork Shoulder, Brisket and Chicken. 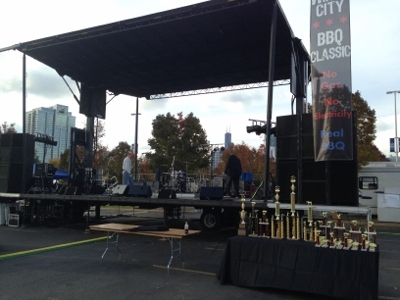 "what an honor to be the MC and Stage host for this event... it was a gorgeous day in Chicago and events like this here prove my point... Chicago people love food.. they love to talk about it, write about it, argue about it and enjoy it.. My thanks to Pitmaster/Chefs and event organizers Jared and Amanda Leonard and Gary Wiviott for all their hard work to make this event so successful"
Tim Mikeska returned to the 2014 Kentucky BBQ Festival as demo stage host and Pitmaster interviewer. 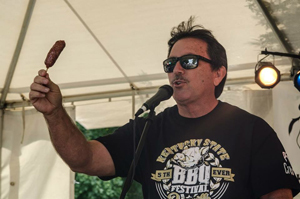 He also was a judge for the Baroness and Baron of the Backyard rib cookoff... "it was great getting to see all my Kentucky BBQ Festival friends and some of the BEST Pitmasters in the country... the crowds this year were huge...!" 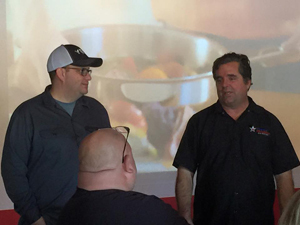 Tim Mikeska of Mikeska Brands Texas BBQ and Kent Black of Black's BBQ in Lockhart were session speakers about the evolution of Czech and German sausage in Central Texas. 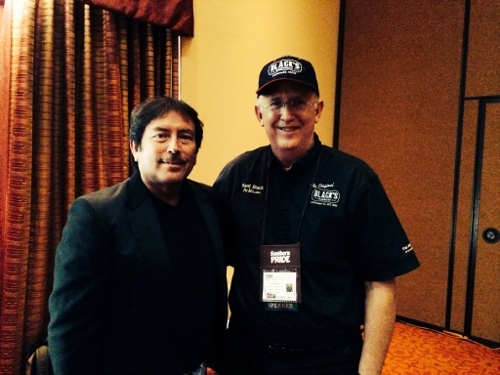 The highlight of the NBBQA was getting to meet Mike Mills. 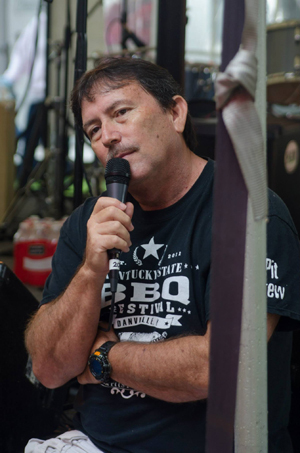 In the world of barbecue, champion pitmaster Mike Mills is affectionately known as “The Legend.” He presides over the pits at his five nationally acclaimed barbecue restaurants - three 17th Street Bar & Grill restaurants in Southern Illinois and two Memphis Championship Barbecue restaurants in Las Vegas. 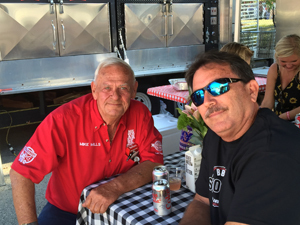 In the early 1990s, he was co-captain of the Apple City Barbecue team, one of the most celebrated teams ever on the circuit. He is a four-time World Champion and three-time Grand World Champion at Memphis in May, otherwise known as the Super Bowl of Swine. He is also the 1992 Grand Champion of the Jack Daniel’s World Invitational Barbecue Cooking Contest and he won the Jack Daniel’s Sauce Contest that year as well. Mike is the barbecue guru at and a partner in Blue Smoke restaurant in New York City. 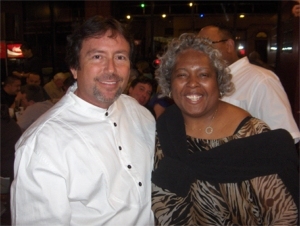 His book, Peace, Love, and Barbecue was nominated for a 2006 James Beard Foundation award and received the 2006 National Barbecue Association Award of Excellence. 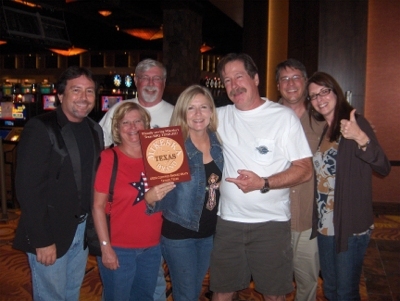 In October 2008 he was honored with the Pioneer of Barbecue award at the Jack Daniel’s World Invitational Barbecue Cooking Contest. 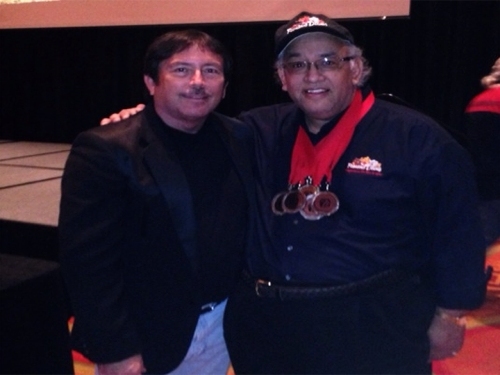 Mike was inducted into the Barbecue Hall of Fame in 2010. Just next door to Vencil’s place in Taylor was a small storefront that Rudy Mikeska first used in 1952 to sell his sausage. He later moved to Second Street just across the parking lot from Louie Mueller Barbecue. This is the barbecue joint that Tim Mikeska ran for a years before closing it to focus more on the family sausage business. 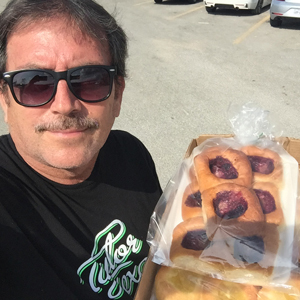 He sells so much Czech sausage in the Windy City that he calls himself the sausage king of Chicago, a real-life Abe Froman (shout-out to the Ferris fans out there). The well-respected Smoque BBQ on Pulaski Avenue sells his sausage right next to their excellent smoked brisket. Tim Mikeska is a bit of a family historian, so he has better notes on his family’s old sausage recipes than most. [The recipe] would have originated from Zadverice, Moravia and would have come with my great grandfather to Texas around 1880. To all these recipes is salt, black or white pepper, paprika and garlic. Other ones also list mustard powder, onion powder, “pinch” of caraway. In going through my emails with old country cousins, Bohemia influenced more garlic, allspice, and marjoram. 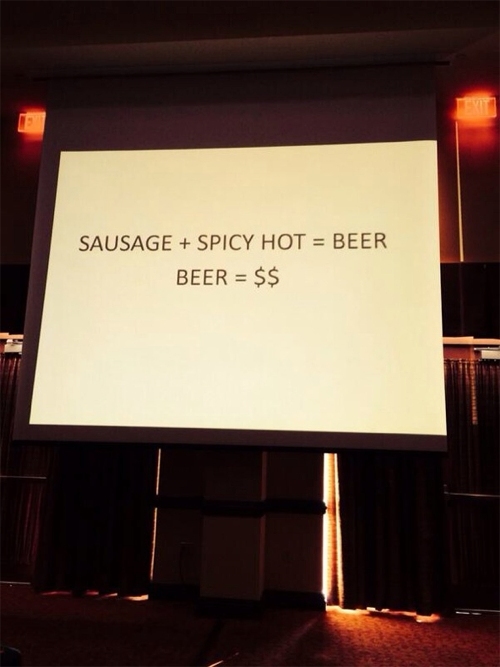 The recipe that Tim Mikeska sells today is more focused. Beef, pork, salt, black pepper, and garlic are joined only by cayenne. This is the same sausage that Rudy was selling out of that tiny storefront in 1952. Chef and Pitmaster Randy Twyford from Twyford BBQ and Catering showcased a Mikeska Family traditional Hot Czech Buttered Potatoes combined with Mikeska Brands Spicy Pork Sausage. This recipe has been in the Mikeska Family for generations. Click here to view VIDEO...! 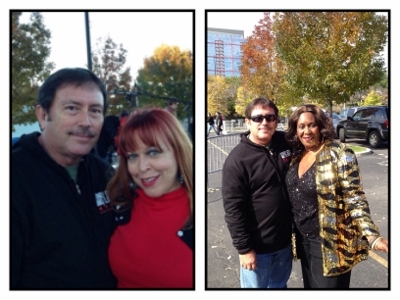 ABOUT: Randy Twyford from "Masterchef" is one of the contestants on the FOX reality cooking competition series. Randy ("Masterchef") is from Jacksonville, Illinois. Twyford BBQ and Catering is proud to be able to bring true, championship quality BBQ to this area. Our catering business is born out of a true passion for great food. Our credibility comes from our competition background. 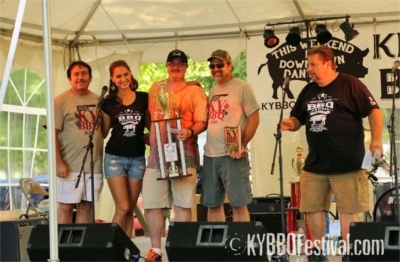 Our BBQ has been professionally judged and awarded top honors by a field of certified, professional food judges that include some of the greatest names in BBQ and the food world. We have amassed 10 Grand Championships, 5 Reserve Grand Championships and dozens of 1st place awards and top ten honors for our chicken, ribs, pork, brisket, sides and desserts. At the urging of friends and family we want to share our love of great food with you. When you’re ready to provide your family, friends or clients with great BBQ and gourmet cuisine that has earned the right to be considered the best, let Twyford BBQ and Catering make your next event one your guests won’t soon forget. 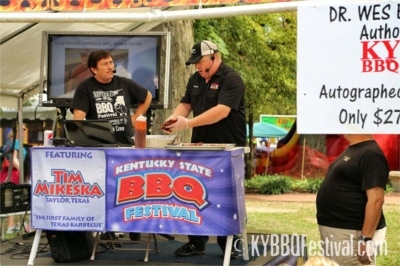 Tim Mikeska, CEO of Mikeska Brands Texas Bar-B-Q was the featured expert on the demonstration stage at the 3rd annual Kentucky BBQ Festival. 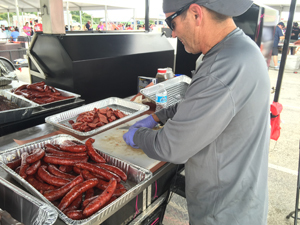 Tim was featured along with his Mikeska Brands Sausage for the 2 day event showcasing great BBQ from some of the most famous Pitmasters in America. Tim was joined with..... Moe Cason, Ponderosa Barbecue, Des Moines, IA, BBQ Pitmasters Finalist; Shelly Hunt, Desperado’s Barbecue, Angola, NY; Melissa Cookston, BBQ Pitmasters Finalist, 2 time Memphis in May Champion and owner of Memphis Barbecue Co., Horn Lake, MS and Fayetteville, NC; Craig Kimmel, Firehouse BBQ, BBQ Pitmasters Finalist, Food Truck Challenge, DeLand, FL; Carey Bringle, Peg Leg Porker, Nashville, TN; Shane Draper, Draper’s BBQ, Cunningham, KY; Brad and Cindy Simmons, Lucky Dog BBQ, Danville, KY. Tim showcased his experience as a Master Butcher, Sausage Maker and Pitmaster. Mikeska's Texas Bar-B-Q In New York! 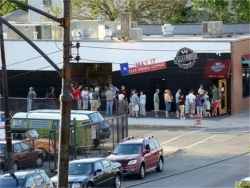 Mikeska Brands Texas Bar-B-Q has finally cracked the New York Market! 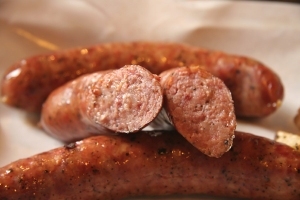 The cold upper New York State just got warmer with some Texas HOT Sausage! 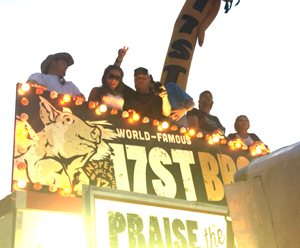 Desperados Barbecue owner and Pitmaster Shelly Frisch-Hunt says... "Tim, sausage is starting to fly outta here!" Mikeska Brands is proud to finally get into the New York Market and our distributors at Wichita Packing in Chicago and Latina Blvd Foods in New York are key players in this milestone. 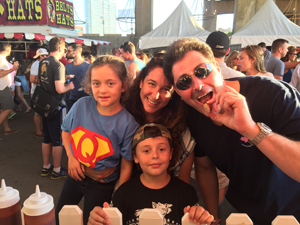 About Desperados Barbecue and Catering Company: A fascination with regional cuisine's and extensive travel gave Desperados the opportunity to sample barbecue fare from Mexico to Canada and everywhere in between. While we loved the vinegar or mustard based sauces from the Carolinas and the tomato based sauces throughout the midwest, nothing compared to the taste we found at "Desperados" in Emporia, Kansas, our friends and namesake. 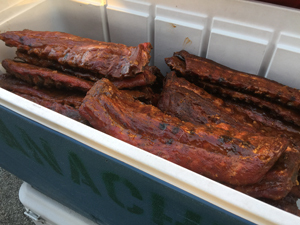 (thank you Mandy & Sue) Desperados taught us how to use St. Louis style ribs and a smokehouse process to create succulent, tender and juicy meat. Their house barbecue sauce was so good we bottled it. It sure beat the plane tickets we were buying to fly there to eat. We took the original recipe a step further with the addition of our special blend of dry rub, white hickory smoking wood, and cooking "tips and tricks" of some of the country's most award winning pitmasters and years of barbecue research. We now specialize in ribs, chicken, pulled pork and some pretty authentic Texas Brisket. All of our meats have won numerous awards and accolade's at regional tastes, competitions and food shows. 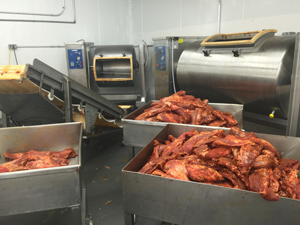 Most importantly we slow smoke our meat in a Genuine Friedrich Smokehouse to assure you the quality and consistency you've come to expect over the years on a daily basis at our restaurant in Angola, New York. The result is a taste sensation we know you won't soon forget. We sure couldn't and we had to bring it home to you. 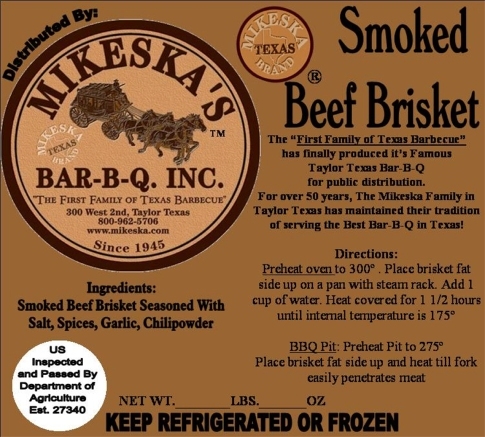 ABOUT Mikeska Brand Products: Mikeska Brand Products is a subsidiary of Mikeska’s Bar-B-Q, a 75 year Texas Family Food Dynasty. 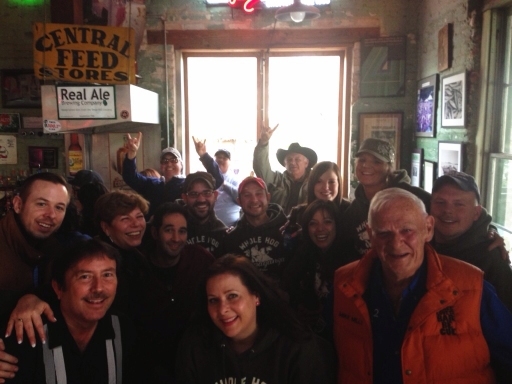 Mikeska’s is known as "The First Family of Texas Barbecue!" 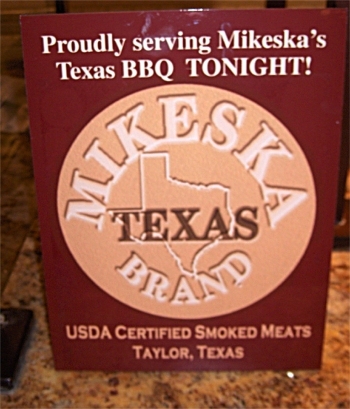 Mikeska Brand Texas Bar-B-Q is now being distributed to 13 US States. Tim Mikeska has announced that Latina Blvd Foods in New York State is now carrying Mikeska Brands Spicy Pork Sausage. Please contact their sales staff at 716-656-8400 for information about supplying your restaurant with our Texas BBQ! 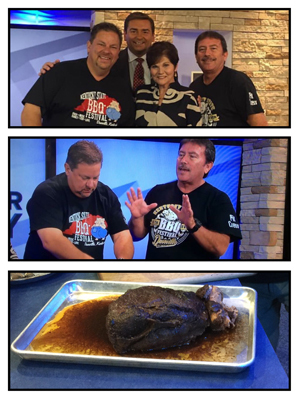 Tim Mikeska with Mikeska Brands was thrilled to accompany Steve Dolinsky with ABC7 Chicago on a tour of central Texas BBQ. Alot of BBQ was consumed in a few days of intense eating fun. 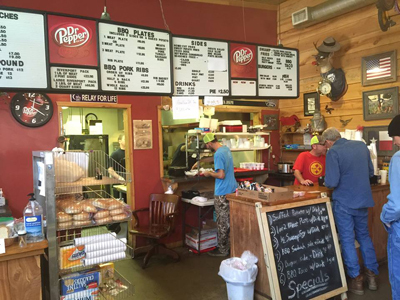 Austin, Lockhart, Luling, and Lexington Texas's BBQ joints were featured. 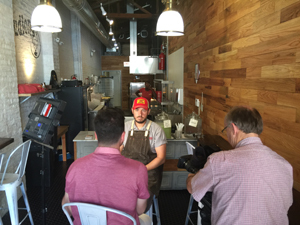 Tim was featured on ABC7's Hungry Hound TV program talking about Texas Sausage and his friends at Stiles Switch BBQ in Austin. 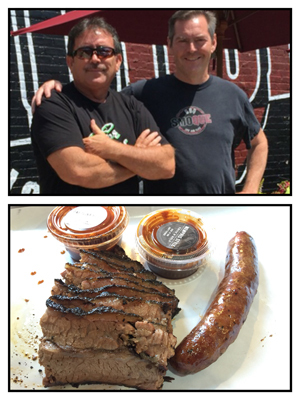 Also on the tour was Tim's friend Barry Sorkin with Smoque BBQ in Chicago. 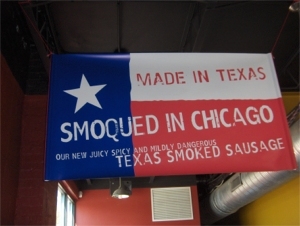 Smoque has become the most critically acclaimed BBQ in Chicago and Mikeska Brands largest customer of their Texas Spicy Pork Sausage. About Steve Dolinsky: ABC 7's lifestyle and food reporter Steve Dolinsky reports "The Hungry Hound" Wednesdays and Fridays on ABC 7 News at 11 a.m. 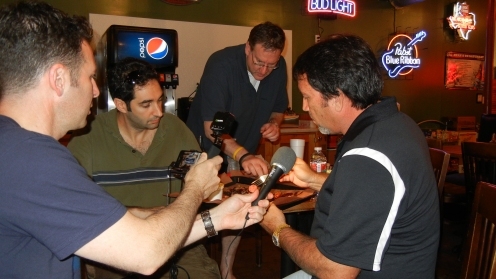 In January, 2006 his role at the station expanded and The Hungry Hound: Friday Night Special can now be seen on the station's top rated 10 p.m. newscasts on Friday evenings as well. Steve has garnered 12 James Beard Awards for his TV and radio work over the past decade: six for best local TV cooking show in the nation, one for best TV food segment, local or national; two for best radio segment on food long form and three for best radio segment short format. In 2002, Dolinsky founded Culinary Communications, a media training business focusing on the food industry outside of Chicago. Dolinsky is also very involved in several not-for-profit agencies in the Chicago area, including Meals on Wheels and Share Our Strength. Dolinsky has a Bachelor of Arts degree in Journalism and History from the University of Wisconsin - Madison. 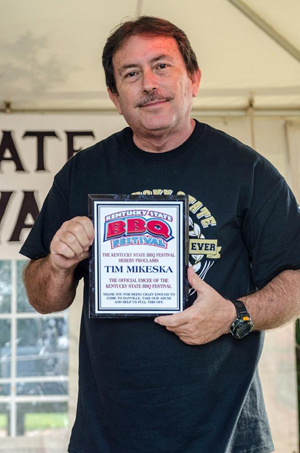 About Tim Mikeska: Tim Mikeska is CEO of Mikeska's Bar-B-Q Inc. and owns Mikeska Brands. Raised in Taylor Texas, and son of Rudy Mikeska, Tim learned to cook at an early age and grew up making sausage and catering Texas Bar-B-Q with his father. Tim has served US Presidents, US Congress, Texas Governors, British Royalty, Texas Legislature, actors and famous musicians throughout the United States. He has also served his Texas Bar-B-Q in England, Germany, Bosnia, and Canada. 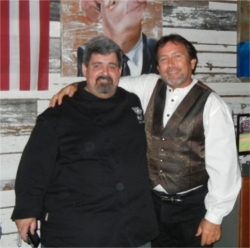 Tim has been featured on the Food Network's Food Nations program with Chef Bobby Flay, The Travel Channel with Andrew Zimmern, the CBS Early Show and 4 books about Texas Bar-B-Q. Some of Tim's proudest moments were traveling to Bosnia to serve his Bar-B-Q to U.S. Peacekeepers on July 4th and to Texas Task Force One upon their return from New York and rescue operations at the World Trade Center. He also served the 4th Infantry Division upon their return to Texas after capturing Saddam Hussein and donated a feast for over 3,000 Texas National Guard Soldiers and their families upon their return from active duty in Europe. Tim has focused his future business with his popular Mikeska Brands USDA Certified Smoked Meats currently in 13 U.S. States. Chicago Il, May 23, 2012... Famed Lincoln Park Restaurant Barn and Company and Pitmaster/Chef, Gary Wiviott hosted a Pitmaster dinner honoring Mikeska Brands CEO Tim Mikeska. A sold out crowd enjoyed an amazing dinner created by Chef Wiviott. 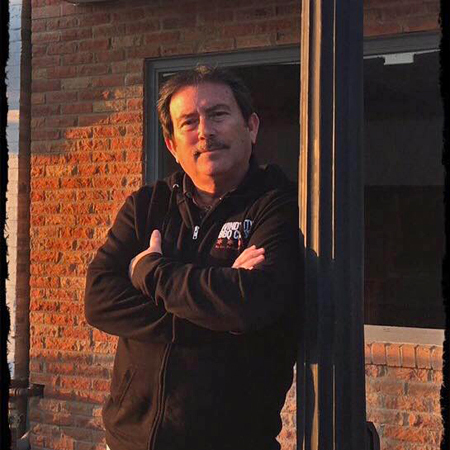 Tim Mikeska spoke about the recent boom of Texas style BBQ in Chicago and how he was honored to be a part of that boom when Smoque BBQ's Barry Sorkin came to Texas 7 years ago to visit with him. Since then, Mikeska Brands has teamed up with Wichita Packing Company to distribute Mikeska Brand products throughout the midwest. Smoque BBQ! 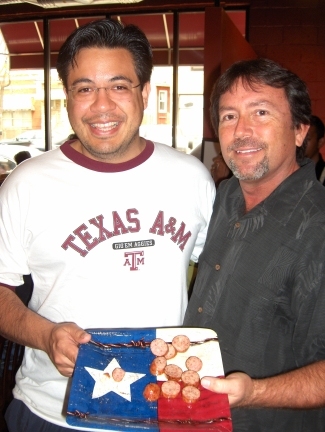 A visit to Texas 7 years ago changed Chicago BBQ forever! 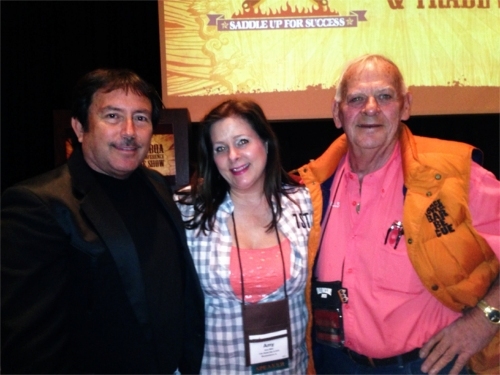 ABOUT Gary Wiviott: is a barbecue life coach. 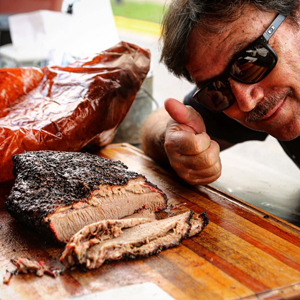 From the popular online tutorial that started it all to his lively cooking demonstrations and teaching diehards how to set up a smoker in Chicago’s notoriously brutal winter weather, he is committed to spreading the gospel of low and slow barbecue. 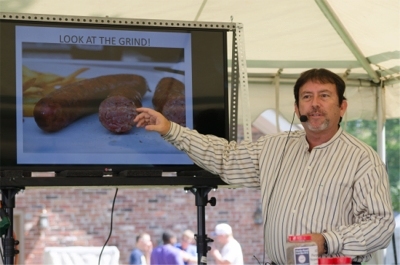 He is no stranger to the most popular national barbecue forums and food communities, including TheSmokeRing.com, Slow Food USA, and the Society for the Preservation of Traditional Southern Barbecue. Gary is also the founder of LTHForum.com, the Chicago-based culinary chat site. 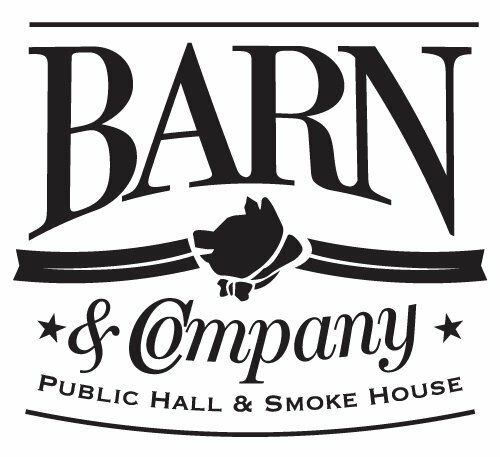 About Barn and Company The team behind Hubbard Inn and English, along with Executive Chef Bob Zrenner & Pit Master Gary Wiviott, unveil their newest venue in the heart of Lincoln Park this August, Barn & Company, a smokehouse and public hall. Barn & Company redefines the all American smokehouse and BBQ shack, with interior elements like reclaimed barn wood walls, rusted tin ceilings, warehouse barn lighting, sleek cement countertops, large open kitchen, with a wood burning pit, big boy smoker and wrap around a court yard for al fresco dining. 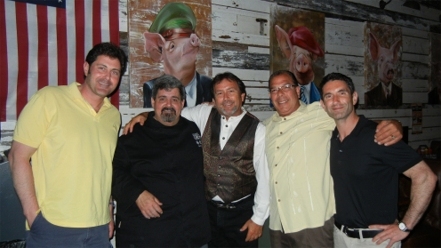 The kitchen is helmed by two Chicago veterans, Executive Chef Bob Zrenner of Hubbard Inn and Consulting Pit Master Gary Wiviott, who is also known for his BBQ cookbooks such as Low & Slow: Master the Art of Barbecue in 5 Easy Lessons and as the Co-founder & Pitmaster Emeritus of LTHForum.com. 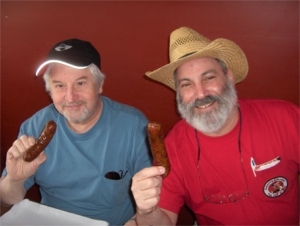 Bob and Gary refer to their menu as hickory smoke barbeque, taking the traditional messy glory of Memphis, Kansas City and Texas-style barbeque and turning it into a full-blown pig picking fest. 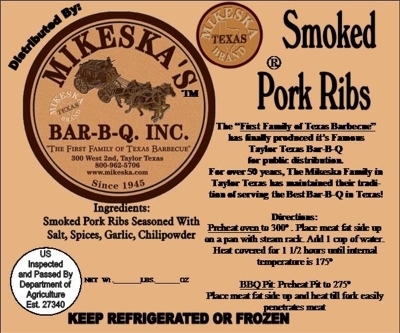 ABOUT Mikeska Brand Products: Mikeska Brand Products is a subsidiary of Mikeska’s Bar-B-Q, a 75 year Texas Family Food Dynasty. 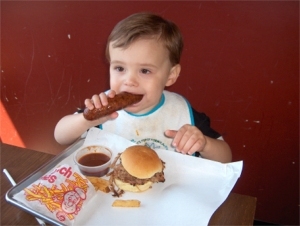 Mikeska’s is known as "The First Family of Texas Barbecue!" 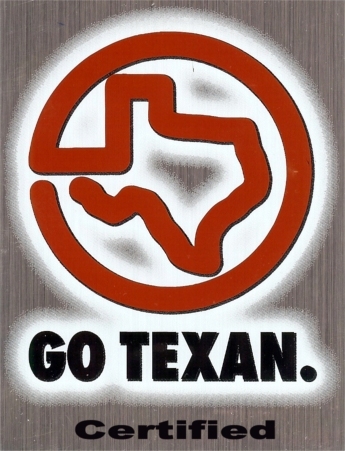 Mikeska Brand Texas Bar-B-Q is now being distributed to 9 US States. 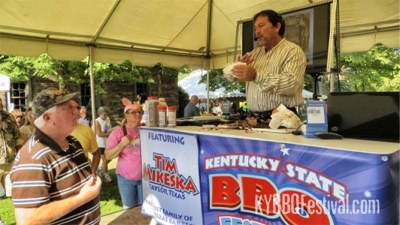 About Tim Mikeska: Tim Mikeska is CEO of Mikeska's Bar-B-Q Inc. and owns Mikeska Brands. Raised in Taylor Texas, and son of Rudy Mikeska, Tim learned to cook at an early age and grew up making sausage and catering Texas Bar-B-Q with his father. Tim has served US Presidents, US Congress, Texas Governors, British Royalty, Texas Legislature, actors and famous musicians throughout the United States. He has also served his Texas Bar-B-Q in England, Germany, Bosnia, and Canada. Tim has been featured on the Food Network's Food Nations program with Chef Bobby Flay, The Travel Channel with Andrew Zimmern, the CBS Early Show and 4 books about Texas Bar-B-Q. Some of Tim's proudest moments were traveling to Bosnia to serve his Bar-B-Q to U.S. Peacekeepers on July 4th and to Texas Task Force One upon their return from New York and rescue operations at the World Trade Center. He also served the 4th Infantry Division upon their return to Texas after capturing Saddam Hussein and donated a feast for over 3,000 Texas National Guard Soldiers and their families upon their return from active duty in Europe. Tim has focused his future business with his popular Mikeska Brands USDA Certified Smoked Meats currently in 9 U.S. States. Smoke City Market in Sherman Oaks California chooses Mikeska Brands Smoked Spicy Beef Sausage and Spicy Beef Sausage with Jalapenos and Cheddar Cheese for their popular Los Angeles area restaurant. Authentic Texas Barbeque in Los Angeles! Smoke City Market is an authentic Texas-style barbeque joint in Los Angeles! At Smoke City Market, located right in the heart of Sherman Oaks, we take no shortcuts. We smoke our meats over natural oak and prepare our sides and sauces (available on the side) from scratch, using only natural ingredients (organic when possible). 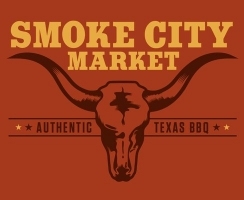 Smoke City Market is proud to bring the rich traditions of authentic Texas barbeque to Los Angeles. 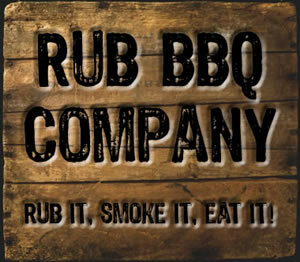 Rub BBQ Company in Chicago chooses Mikeska Brands Smoked Spicy Pork Sausage for their new restaurants. About RUB BBQ COMPANY is a family owned business. Chef Jared Leonard and his wife Amanda love BBQ and LOVE Chicago. “We traveled North America looking for a place to settle. We lived on an island, tried out the desert, and spent some time in the mountains. I grew up in Chicago & met my wife here. We were married here, we recently started our family here, and now we are lucky enough to be sharing our love for BBQ with the great people of this wonderful city.” says Chef and owner Jared Leonard. BBQ is a leisurely hobby, but also a highly skilled craft. Other BBQ teams focus on their sauce; while we respect the competition and their methods, we think it’s the wrong approach. 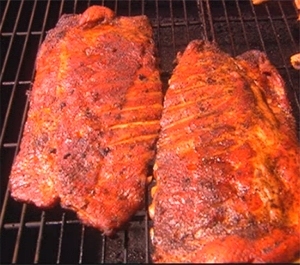 Great BBQ is created simply from top quality meats accompanied by a dry rub. We’ve spent years developing our rub, and are proud to share it with you. Our house-made sauce is served on the side, but most of our customers agree that you don’t need it. OUR MOTTO: RUB IT, SMOKE IT, EAT IT! Mikeska Brands has announced that Chicago based Barn and Company has selected Mikeska Brands Smoked Spicy Pork Sausage for their menu. 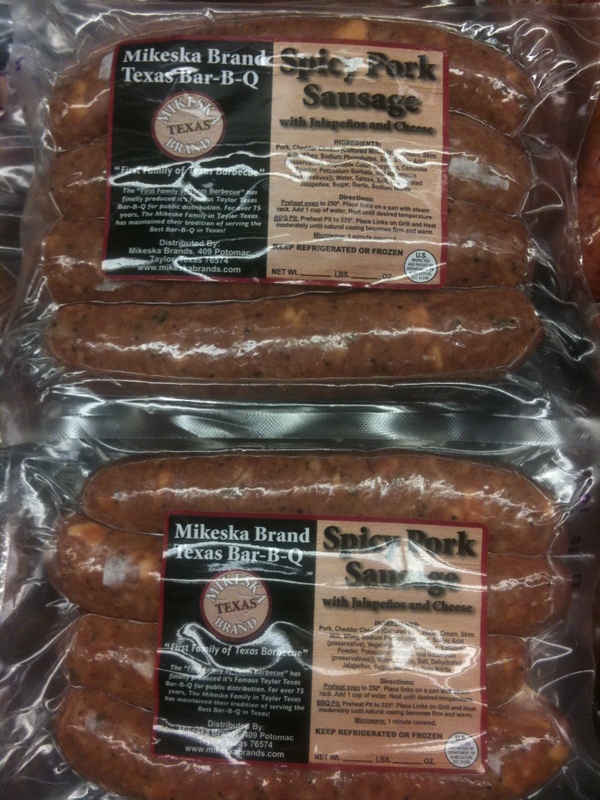 This new addition now adds to the immense popularity of Mikeska Brands sausage in the Chicago area and the midwest. 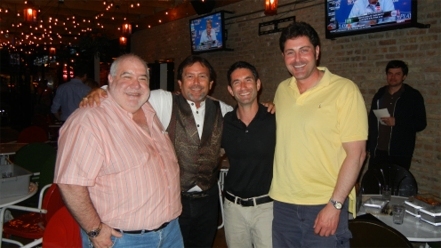 About Barn and Company The team behind Hubbard Inn and English, along with Executive Chef Bob Zrenner & Pit Master Gary Wiviott, unveil their newest venue in the heart of Lincoln Park this August, Barn & Company, a smokehouse and public hall. Barn & Company redefines the all American smokehouse and BBQ shack, with interior elements like reclaimed barn wood walls, rusted tin ceilings, warehouse barn lighting, sleek cement countertops, large open kitchen, with a wood burning pit, big boy smoker and wrap around a court yard for al fresco dining. 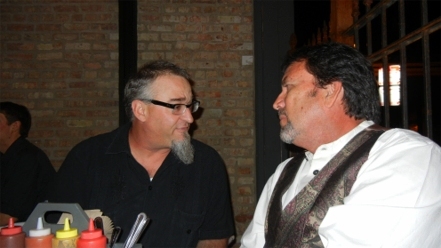 The kitchen is helmed by two Chicago veterans, Executive Chef Bob Zrenner of Hubbard Inn and Consulting Pit Master Gary Wiviott, who is also known for his BBQ cookbooks such as Low & Slow: Master the Art of Barbecue in 5 Easy Lessons and as the Co-founder & Pitmaster Emeritus of LTHForum.com. 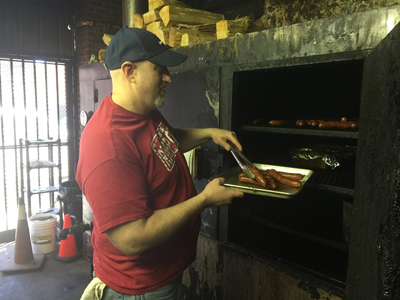 Bob and Gary refer to their menu as hickory smoke barbeque, taking the traditional messy glory of Memphis, Kansas City and Texas-style barbeque and turning it into a full-blown pig picking fest. Say chef Zrenner “We stay focused on brisket, baby back ribs, pulled pork and free range smoked chicken. 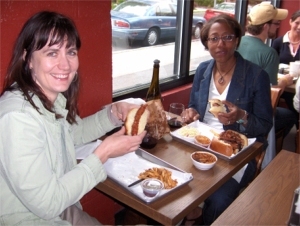 But, for those that aren’t crazy about BBQ we also offer some damn good non- BBQ’d food too.” The menu is sourced from regional farm fresh ingredients and free-range meats, and includes new creations coming out of our smoker like Smoked Pulled Pork Tacos with a Spicy Cabbage Slaw, BBQ Shrimp Taco Chipotle Crème, Pulled Smoked Chicken Cobb Salad and more. Says Chef Zrenner, The bar is stocked with a great selection of American microbrews on draft and bottles, and a variety of bourbon and rye specialty cocktails. 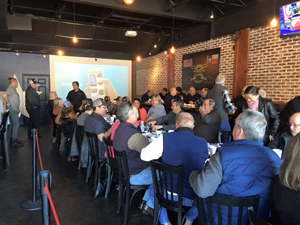 Barn & Company is serious about combining two American passions, BBQ and Football, so a small fortune was spent on visual technology to offer patrons a feast for their eyes. Open Every Day for Lunch and Dinner (except Tuesdays); Capacity for 100 indoor and an additional 75 seats on the patio; valet parking; all major credit cards (but we prefer cash). 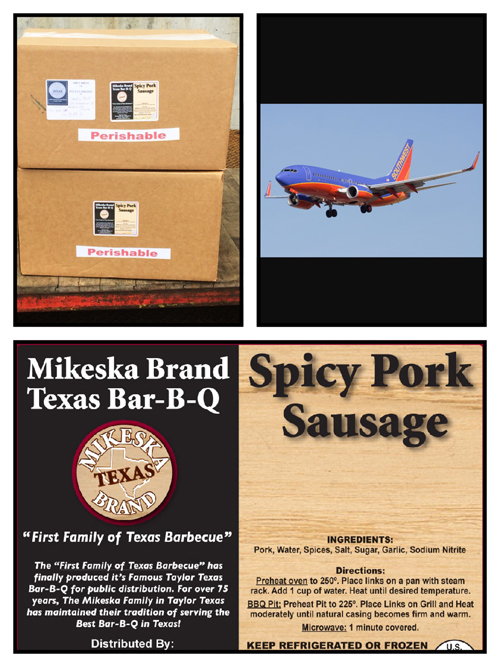 Wichita Packing Company and Mikeska Brands Texas Bar-B-Q partner together to bring real Texas Bar-B-Q to all the United States. 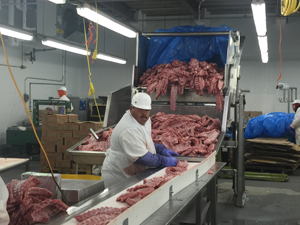 Mikeska Brands has announced that Wichita Packing Company has purchased their first truck load of Mikeska Brand Spicy Pork Sausage for distribution to their wholesale and retail customers throughout the United States. With loads easier to describe by tonnage than pounds....it will allow for an endless supply of Mikeska Brand products to the heart of the US. Tim Mikeska stated... "I have seen Wichita Packing's facility in Chicago and was highly impressed with their reputation and pride in their products. I have met some of their sales staff and they are well informed and very professional. I think this is going to be an historic venture between two well known companies that are dedicated to quality products and customer service." Wichita Packing Company Incorporated in 1963, Wichita Packing Company has evolved into a corporation with global distribution, and is the leading independent provider of pork ribs in the country. Our company is rooted in our earned reputation as a worldwide provider of consistent, quality products. Whether a single unit or an international franchise, it is our goal to work with you to create an application for your establishment, based on your specific needs. Basic specifications we consider are: plate cost and presentation, cooking method, inventory management, and any other special requirements. Once your needs have been fully assessed and your specification set, it's our commitment to provide a high-quality product that meets or exceeds expectations consistently throughout the year. 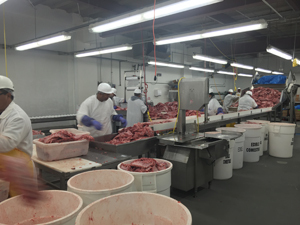 Whether it is our individually graded Pork Loin Back Ribs, our hand cut St. Louis Style Ribs or one of our procurement and distribution items, you can be sure of providing the quality, flavor and value that your customers demand on a committed and consistent basis. Mikeska Brands is proud to add the popular Hickory River Smokehouse's to their growing list of customers selling Mikeska Brand Spicy Pork Sausage. 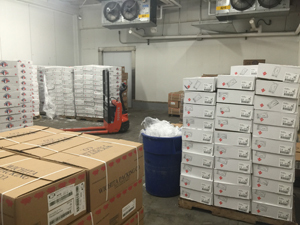 Southwest Airlines Air Cargo operations carried the first load of product to Midway Airport in Chicago for delivery to Hickory River Smokehouse located in Glendale Heights Illinois. December 3, 2010 (CHICAGO) (WLS) -- How did Texas-style barbeque end up in west suburban Glendale Heights by way of Urbana? Click here to see the actual ABC News Channel 7 Chicago video broadcast! A wave of new barbeque restaurants have opened up in the past six months- mainly in Chicago. 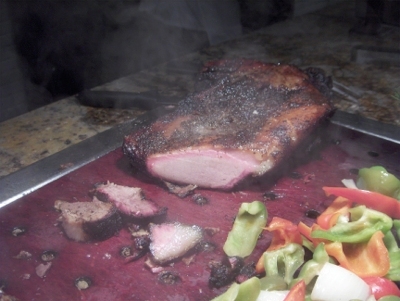 But Hickory River Smokehouse in Glendale Heights slow-smokes just like in Texas. Skeptical at first, ABC7's Hungry Hound said he could tell after a few bites that the Midwestern-based chain meant business. And the stack of hickory wood out back only confirmed his suspicions. Related Content More: Restaurants Hickory Smokehouse takes an old-school approach to a fast-food concept. "Part of that is the sauce that we use; it's more of a smoky flavor type of barbeque sauce, which we think is definitely more like you see in Texas," said owner David Huff. "We are smoking overnight, typically 13, 14 hours, slow and at a very low temperature, using only hickory wood." In addition to chicken, there are two primary proteins in play here: enormous pork butts and gargantuan briskets - both of which are lightly dusted in a homemade dry rub and then placed into the rotating Southern Pride smokers overnight. When they emerge, they are charred, but incredibly soft. 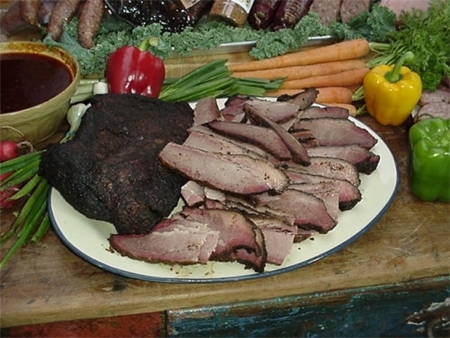 Excess fat is discarded, and in the case of the brisket, it is offered both sliced and chopped. The pork gets a final shower of seasoning, then a superfluous ladle of barbeque sauce before it's summarily pulled apart and torn into shreds. 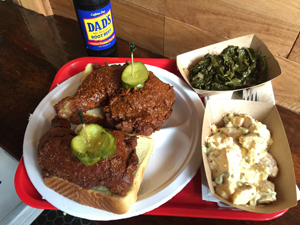 There are decent sides on offer -- macaroni and cheese, baked beans, slaw and mashed potatoes -- but nothing stellar. 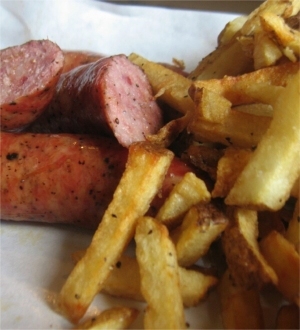 One highlight is a recent menu addition that sausage lovers will appreciate. 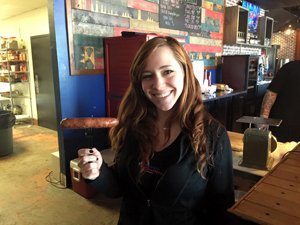 "We just started offering, about a week or so ago, Mikeska sausage, which comes out of the Austin area, and we are the only restaurant in the Chicagoland area - other than one other - that offers that type of sausage," Huff said. Sandwiches are massive, and while a lot of the items come with sauce already applied, try ordering them with sauce on the side; better to appreciate the signature pink smoke ring that requires a lot of patience to produce. "What has been really gratifying to us is just the amount of people that have been coming back, saying how much it reminds them of back home down in Texas, and they can't find our kind of food anywhere else," said Huff. 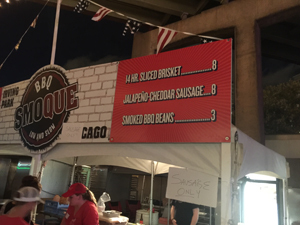 By the way, the "one other place" in the region Huff mentioned that carries the smoked Mikeska Texas sausage is Smoque Barbeque on Pulaski, so you know it's going to be good. ABOUT Hickory River Smokehouse: 2130 Bloomingdale Rd., Glendale Heights, IL 60139 is where Texas barbecue is our passion! Our quality beef brisket, chicken, turkey, and pork are treated with a dry rub - a flavorful way to keep the meat’s natural juices from escaping. After hours over a hickory-wood fire in our on-site smokehouse, the meat is harmonized with a generous side or drizzle of our spicy, tangy Texas-style BBQ sauce! Complete this barbecue phenomenon with one (or more) of our mouth-watering side dishes. 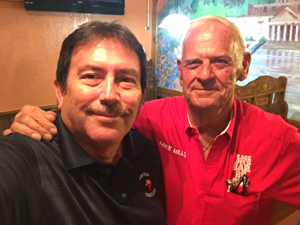 Partners Dave Huff and Brian Abrams invite you to come to our Glendale Heights restaurant soon to taste the best REAL Texas Barbecue in the western suburbs. 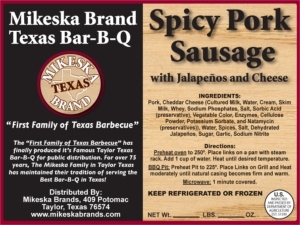 Mikeska Brands announced today that Mikeska Brands Spicy Pork Sausage is now available in the Austin, Round Rock, Cedar Park and Lakeway area Randall's stores. Randall's is a division of Safeway Grocery Stores. and onto a tray Friday at the Lone Star Golf Club. Tim Mikeska, the CEO of Mikeska's Bar-B-Q, gives samples of his smoked brisket, spicy pork sausage and jalapeño sausage at the T-Bone Open on Friday at the Lone Star Golf Club, 1510 Hawkins. Mikeska and his family own a Central Texas food company that Texas Monthly calls "the first family of Texas barbecue." 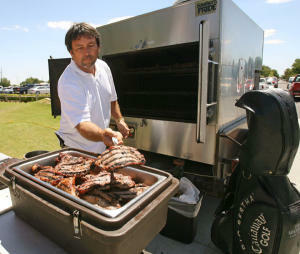 Mikeska served his Ribeye steaks to the professional and amateur golfers at the Lone Star Golf Clubs annual T-Bone Open. 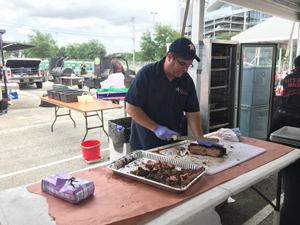 Mikeska also served free samples of his award winning Smoked Beef Brisket, Spicy Pork Sausage and Texas Beef Hot Gut Sausage on Saturday June 19th. in the SandTrap restaurant located at Lone Star Golf Club. ABOUT Lone Star Golf Club: Designed by Marvin Ferguson in 1975, Lone Star Golf Club is a classic, traditional style golf course, complete with tree lined fairways. Although the course layout may appear flat in terrain, subtle breaks in the greens and fairways, and strategically placed sandtraps will test even the best players. Located just minutes from El Paso International Airport, Lone Star Golf Club is the best place to play or practice. A fully lit driving range and two lighted chipping/putting greens, allow you to practice at your convenience, day or night. Lone Star has become The Public Golf Course of El Paso, yet one will feel as if they were at a premiere private club. Between the friendly staff, the well groomed greens, and the excellent food in our restaurant, one might say they have found an Oasis in the desert. Owned and operated by Bueno Investments CEO Benny Vanecek orginally from Taylor Texas and a member of the Famous Mikeska Family Texas Food Dynasty. 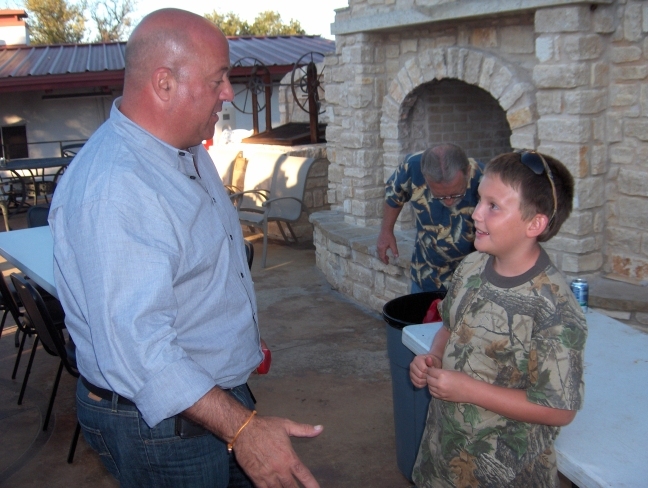 Timothy Mikeska 12 year old son of Tim Mikeska, CEO of Mikeska Brands Texas Bar-B-Q, was featured on the Travel Channels, Bizarre Foods Kids Special with Andrew Zimmern. Timothy was shown cleaning and dressing a native Texas wild mourning dove and sharing the experience with Chef and Host Andrew Zimmern. 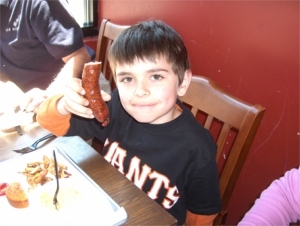 The Travel Channel showcased kids from a variety of world cultures enjoying their native foods. In Texas, hunting mourning doves is a long held tradition. Every fall, dove hunting is a ritual for many Texas hunting families. The Mikeska Family has upheld that tradition along with cooking and consuming everything that they hunt. Timothy has been hunting with his father since he 3 years old. According to Chef and Host Andrew Zimmern.... "our salute to what kids eat around the world is also a prescription for a better food life for our kids, one that has been test driven by families around the world for us. 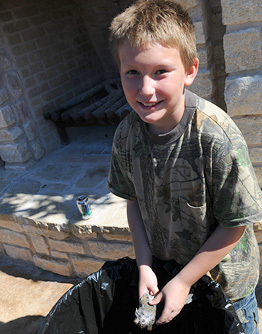 If it looks good, eat it"
About Timothy Mikeska: is 12 years old and son of Tim Mikeska and grandson to famed late Texas Barbecue Legend Rudy Mikeska Sr. Raised in Taylor Texas, Timothy attended St. Mary's Catholic School and now attends Kelly Lane Middle School in Pflugerville Texas. An avid hunter and sports enthusiast, Timothy plays competitive golf and enjoys playing football. Timothy has a well known appetite for anything exotic.. including sushi, crawfish, boudin, caviar, and sweetbreads. About Andrew Zimmern is a James Beard Award-winning TV personality, food writer, chef, teacher and is regarded as one of the most versatile and knowledgeable personalities in the food world. As the co-creator, host and contributing producer of Travel Channel's hit series, Bizarre Foods with Andrew Zimmern and Andrew Zimmern's Bizarre World, he travels the world, exploring the food in its own terroir, wherever it's found. From restaurants to jungle markets, it's all about discovering the authentic experience. 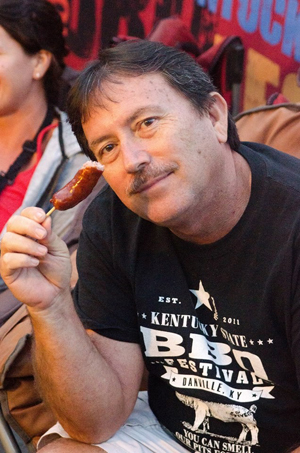 Tim Mikeska CEO of Mikeska Brand Texas Bar-B-Q has just been declared "the new Abe Froman" Sausage King of Chicago. The name comes from the fictional character in the John Hughes 1986 hit film "Ferris Bueller's Day Off". 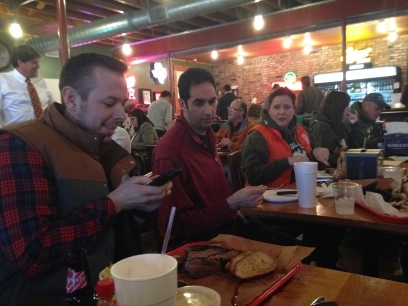 Chicago food writers with Urbanspoon, LTH Forums, Time Out Chicago, YELP and Zen of Barbecue have all taken notice of Tim Mikeska's hit Spicy Pork Sausage being served by the popular Chicago BBQ mecca Smoque BBQ. 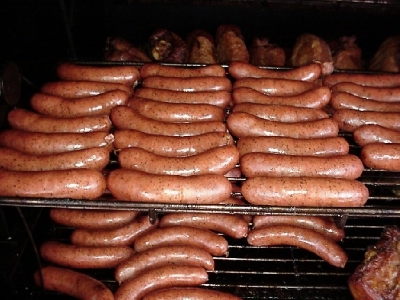 The lean and spicy pork sausage is made deep in the heart of central Texas and shipped in large quantities to Chicago. 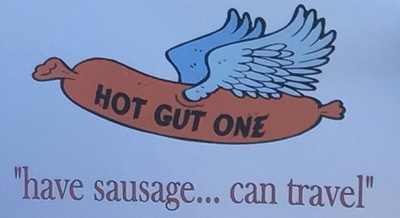 Emergency shipments of his sausage come via Southwest Airlines Air Cargo operations... dubbed.. "Hot Gut Airlines". Tim stated... "I am a big fan of that movie and would have never guessed that I would be called a sausage king, especially in Chicago where there is so much great sausage". 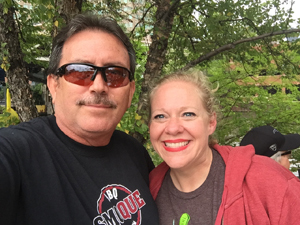 Smoque BBQ has had amazing success in Chicago, garnering numerous awards. One of the busiest restaurants in Chicago, serving more than 10,000 guests per week. Smoque has been featured on Food Network, New York Times and was rated top BBQ in Zagat's new restaurant guide. Mikeska Brands, a Texas distributor of USDA certified meats, announces their Mikeska Brand Texas Bar-B-Q is now available in multiple locations throughout South Carolina. 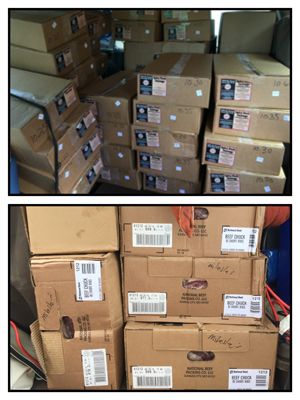 Smoked Beef Brisket, Smoked Beef Tri-Tip, and Mikeska Brand Sausages are being shipped from their Taylor and Thorndale, Texas USDA Plants to South Carolina. About Melvin's BBQ: Melvin Bessinger's Barb-B-Que Restaurants have been a South Carolina Landmark since 1939. 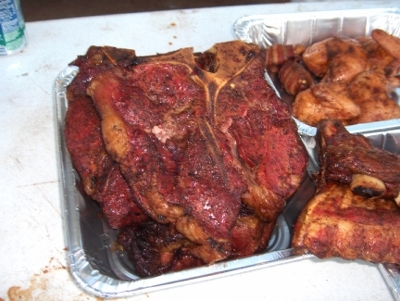 We have become famous for the best St. Louis Style Pork Ribs, Chicken and "All Ham" Bar-B-Que in the South. But don’t take our word for it, come on down and experience the flavor. 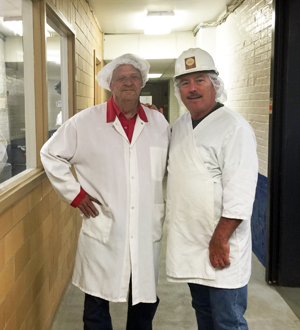 The Bessinger family has been called the "First Family of South Carolina BBQ"
ABOUT Mikeska Brand Products: Mikeska Brand Products is a subsidiary of Mikeska’s Bar-B-Q, a 63 year Texas Family Food Dynasty. 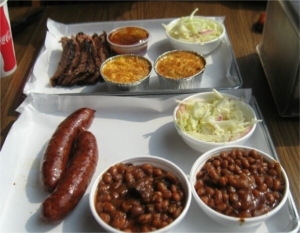 Mikeska’s is known as "The First Family of Texas Barbecue!" 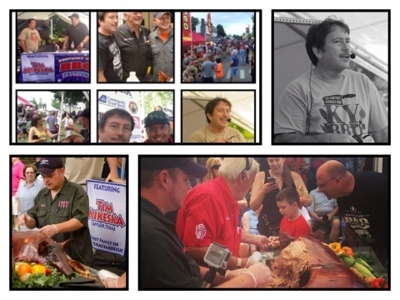 Mikeska Brand Texas Bar-B-Q is now being distributed to 9 US States. Mikeska Brands, a Texas distributor of USDA certified meats, has announced their authentic Texas Bar-B-Q will be a featured product within SYSCO Company. 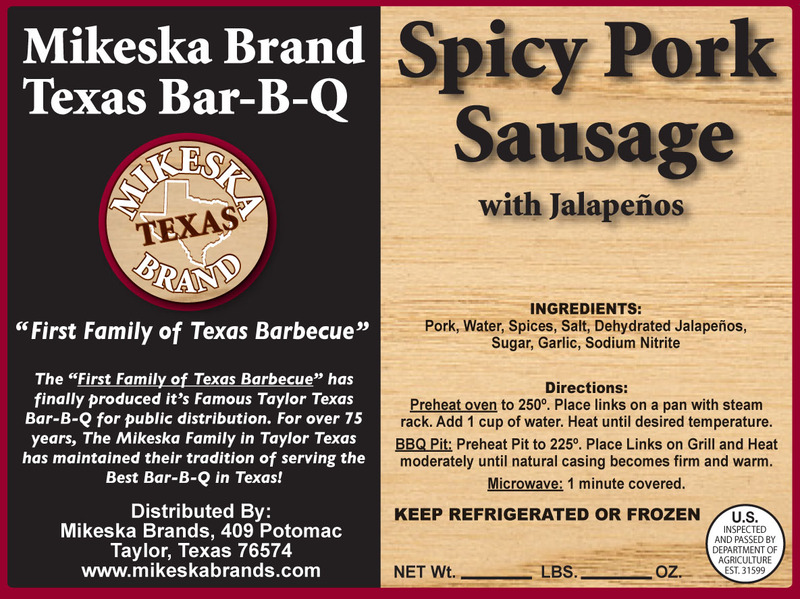 Mikeska Brand USDA Smoked Spicy Sausage is available to all SYSCO Distribution Centers throughout the United States. About SYSCO Company: Sysco is the global leader in selling, marketing and distributing food products to restaurants, healthcare and educational facilities, lodging establishments and other customers who prepare meals away from home. Its family of products also includes equipment and supplies for the foodservice and hospitality industries. The company operates 186 distribution facilities serving approximately 400,000 customers. For the fiscal year 2009 that ended June 27, 2009, the company generated more than $36 billion in sales. For more information about Sysco visit the company’s Internet home page at www.sysco.com. "We are very excited about Mikeska Brands BBQ being included among all the great food being served at the Silverton. 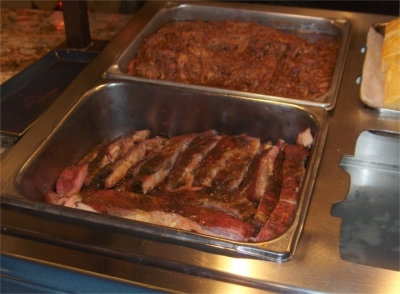 Beginning Thursday November 6th, Mikeska Brand Smoked Beef Brisket, Spicy Pork Sausage, and Smoked Pork Spareribs will be featured at the Seasons Buffet. The Silverton is an exciting place to visit and it's 4 unique restaurants offer some of the very best dining and entertainment in Las Vegas. Mikeska Brands has partnered with Southwest Airlines Air Cargo to provide priority air cargo handling from Austin's freight terminal direct to Las Vegas. 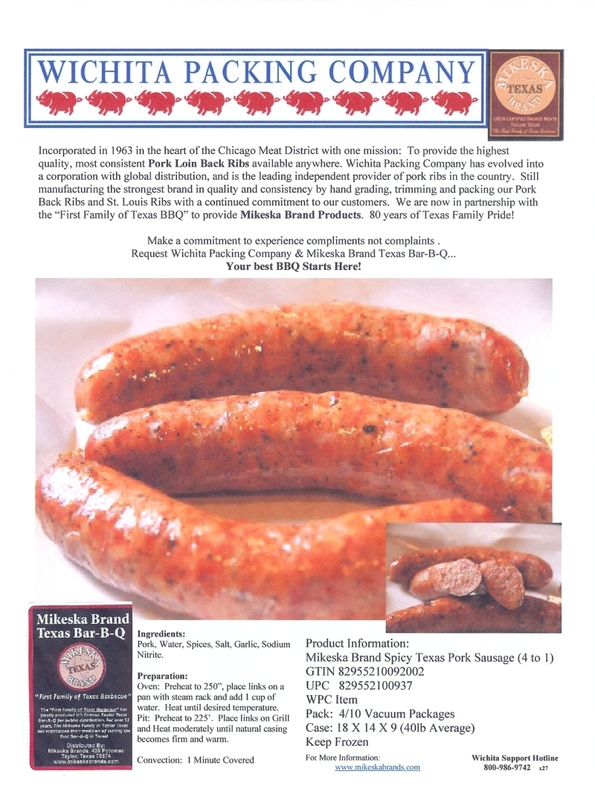 Besides their home state of Texas and now Las Vegas, Mikeska Brands currently sells their Smoked Spicy Pork Sausage at the critically acclaimed Smoque BBQ in Chicago Illinois. Voted “Best Locals Casino” in AOL CityGuide’s City’s Best of awards, Silverton Casino Lodge is located three miles south of Mandalay Bay at I-15 and Blue Diamond Rd./Dean Martin Dr. The property offers all-inclusive amenities characteristic of an upscale, contemporary luxury lodge-themed resort. Silverton’s attractions include the world-class, live action Seasons buffet, Sundance Grill, a terrific 24-hour restaurant/grill, the Zagat Las Vegas Nightlife listed Shady Grove Lounge, the Epicurean award winning Twin Creeks featuring boutique bourbons, wine and food and the new, Mexican-inspired Mi Casa Grill Cantina as well as 300 deluxe rooms and suites that offer luxurious amenities. 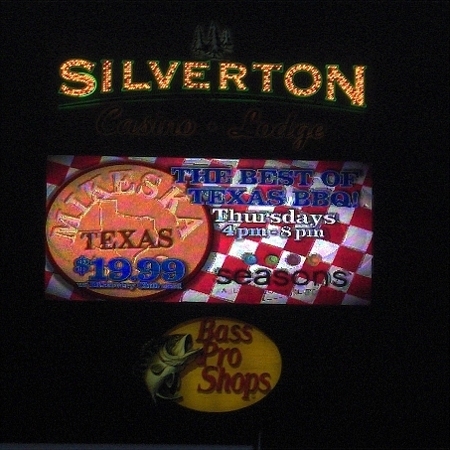 Silverton offers 60,000 square feet of gaming with 1,400 slot machines and 30 table games, an intimate poker room and the Mermaid Restaurant & Lounge. The property features a 117,000 gallon saltwater aquarium, voted “Best Free Attraction” in the Best of Citysearch 2008 awards, with more than 5,000 sharks, stingrays and tropical fish. Bass Pro Shops Outdoor World a 165,000 square foot mecca for outdoor hunting and fishing enthusiasts resides within the Silverton Casino Lodge complex. Bass Pro Shops is the leader among fishing shops in Las Vegas, from their 40,000 gallon freshwater aquarium and authentic trout stream to their wide selection of fishing equipment and modern and antique firearms. 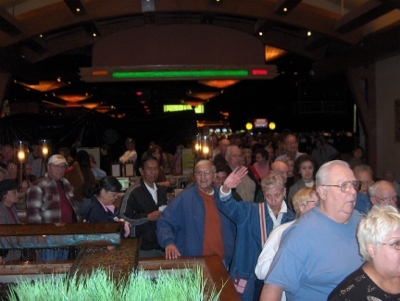 Long lines at the Buffet that backed up into the Casino. enjoying real Texas BBQ in Las Vegas! 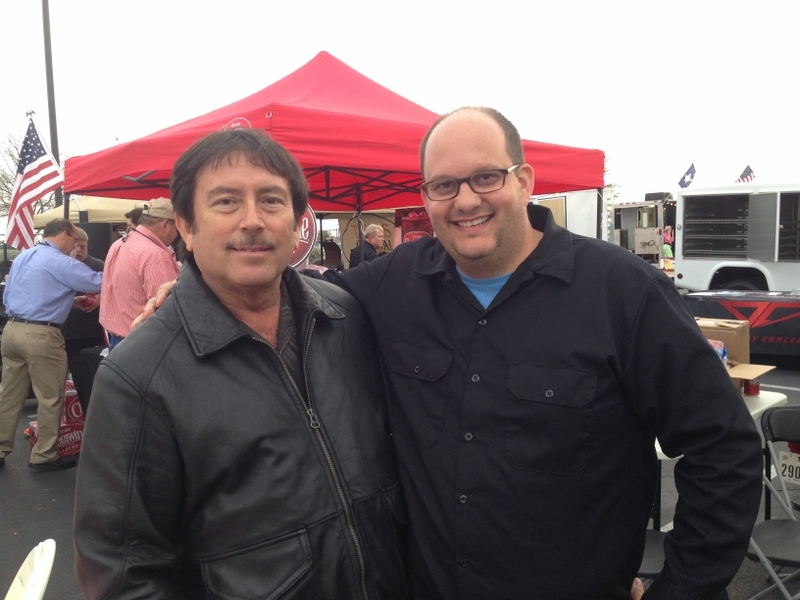 The Travel Channels Andrew Zimmern featured the Mikeska Family from central Texas on his popular program that highlights regional food delicacies. 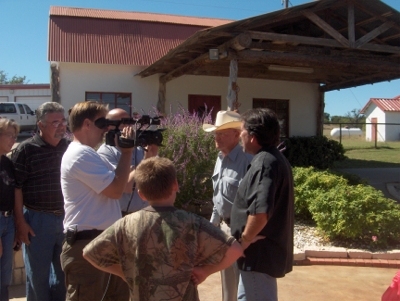 The program was filmed at their cousins Circle V-BHARRE Exotic Game Ranch in Bosque County Texas. 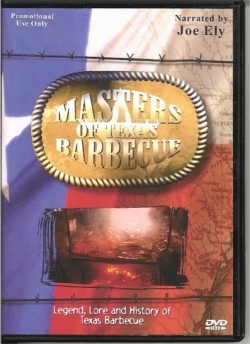 Tim Mikeska and his 11 year old son, Timothy Mikeska were featured preparing their famous Texas Bar-B-Q... Beef Brisket, Tri-Tip, Smoked Sausage, Pork Ribs, and Porterhouse Steaks. Along with their Bar-B-Q, Tim showcased some of their Czech family traditional foods.... Jitrnice (Czech pork liver sausage), Smoked Sweetbreads (thymus glands), Head Cheese, Head Sausage, Bacon Wrapped Jalapeno Smoked Wild Dove, Smoked Mutton Breast which was awarded the "Best OffBeat BBQ by Texas Monthly Magazine.... and exotic wild game that was harvested on the ranch. The Travel Channel producers filmed the preparation of all these items by Tim Mikeska as he described their relevance to their family. These foods have been part of the Mikeska Family's traditional meals for generations, handed down from their Czech ancestors who immigrated to the USA in the late 1880's. Also featured on the program were other members of the Mikeska Family. Clem Mikeska, patriarch of the Temple Texas Mikeska Family described their start in the meat business when his father John Mikeska took all his young sons with him to butcher, process and cook meats for rural families near Taylor Texas in the 1930's. Those skills learned at an early age by the Mikeska boys eventually turned into a very successful Texas Bar-B-Q Family Empire when Texas Monthly declared them..."The First Family of Texas Barbecue". Mike and Jobeth Vanecek owners of the renowned Circle V-BHARRE Ranch and first cousins of Tim Mikeska, hosted the event at their Spanish Hacienda style home. A safari tour of all the exotic animals and native Texas whitetail deer were highlights of the program. 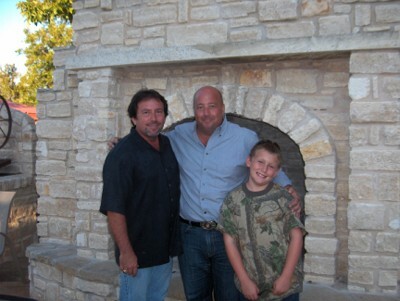 Andrew Zimmern then sat down with the Mikeska Family for dinner and talked about the prepared foods while eating dinner on the ranch's outdoor patio that features one of the largest outdoor fireplaces in the world... over 25 feet tall and built with over 40,000 lbs of native limestone. The Travel Channel Program featuring the Mikeska Family will be broadcast in the spring of 2009. About Andrew Zimmern: Andrew Zimmern is a food writer, TV personality, chef, teacher and is regarded as one of the most versatile and knowledgeable personalities in the food world. As the cocreator, host and contributing producer of Travel Channel's hit series, "Bizarre Foods With Andrew Zimmern," Andrew travels the world, exploring the food in its own terror, wherever it's found. From restaurants to jungle markets, it's all about discovering the authentic experience. 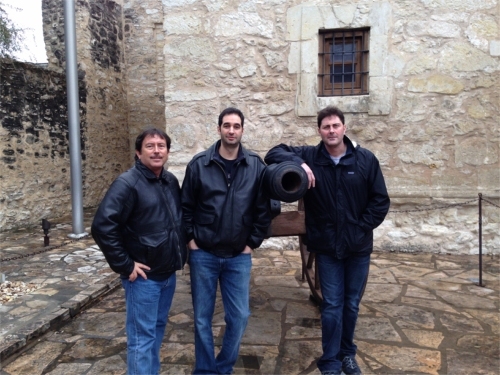 About the Mikeska Family: The Mikeska Family is a well respected Central Texas food dynasty known as..."The First Family of Texas Barbecue" by Texas Monthly Magazine. John Mikeska Sr. and later his wife, Francis Valis Mikeska immigrated to the United States from the Moravian and Bohemian regions of eastern Europe in the late 1880's. 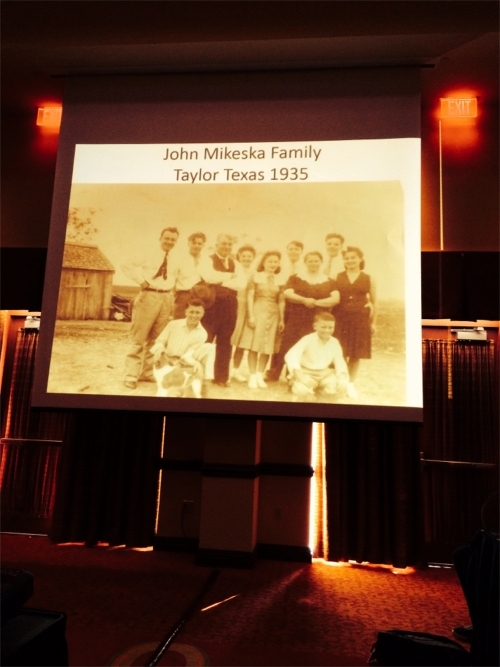 Settling near Taylor Texas, the Mikeska's raised 6 boys and 3 girls in the fertile farmland south of Taylor. Using their skills as butchers, the Mikeska Family operated a "beef club" that specialized in processing animals in the rural areas near Taylor Texas. 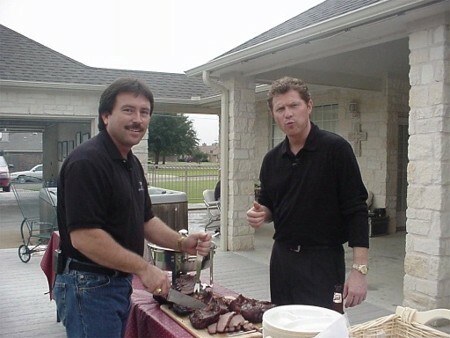 Each of the Mikeska boys went on to operate successful Texas Bar-B-Q and Catering businesses throughout Texas. John in Smithville, Louie in Temple, Rudy in Taylor, Jerry in Columbus, Maurice in El Campo and Clem in Temple. 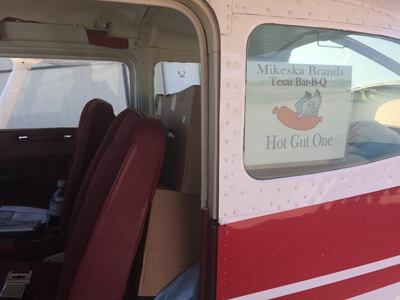 That tradition continues into the 3rd generation with Mikeska cousins operating Bar-B-Q and Catering operations in Taylor, Temple, Cameron, Killeen, Belton, Columbus and El Campo Texas. 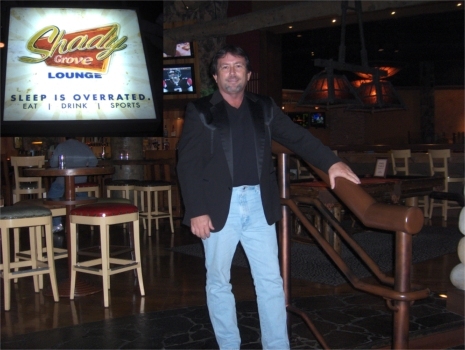 About Tim Mikeska: Rudy L. "Tim" Mikeska is CEO of Mikeska's Bar-B-Q Inc. and owns Mikeska Brands. Raised in Taylor Texas, and son of Rudy Mikeska, Tim learned to cook at an early age and grew up making sausage and catering Texas Bar-B-Q with his father. 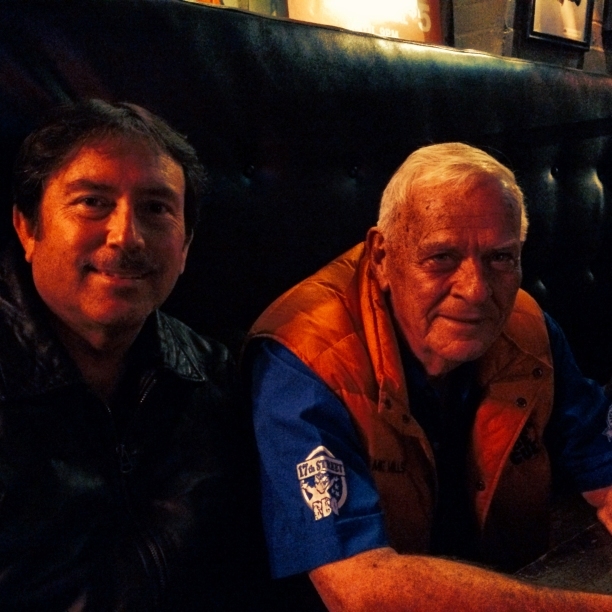 Tim has served US Presidents, US Congress, Texas Governors, British Royalty, Texas Legislature, actors and famous musicians throughout the United States. 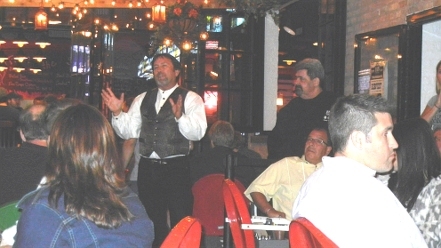 He has also served his Texas Bar-B-Q in England, Germany, Bosnia, and Canada. Tim has been featured on the Food Network's Food Nations program with Chef Bobby Flay, the CBS Early Show and 4 books about Texas Bar-B-Q. Tim has focused his future business with his popular Mikeska Brands USDA Certified Smoked Meats currently in 3 U.S. States. A Mikeska sized Porterhouse Steak! Both Barry and Tim have the unique honor of being featured on the Food Network. 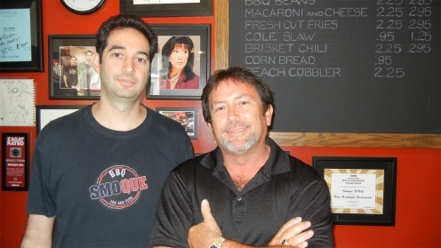 Barry’s Smoque BBQ was featured on Diners, Drive-Ins, and Dives. 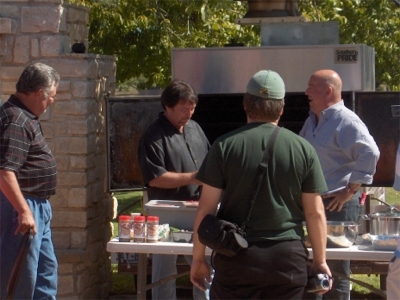 Tim Mikeska’s Bar-B-Q was featured on famed Chef Bobby Flay’s FoodNations program. As the sole Midwest distributor of Mikeska Brand Products, Smoque BBQ will have the rights to distribute these products throughout the Midwest. 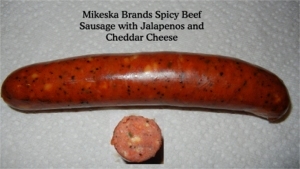 Mikeska Brand consists of over 12 unique meats. Some of which include: Smoked Beef Brisket, Smoked Whole Cornish Game Hens, Smoked Beef Tri-Tip, Smoked Whole Beef Ribeye and an assortment of Seasonings. 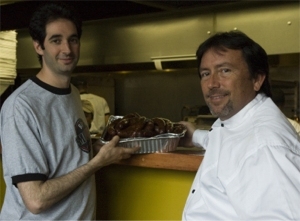 Barry Sorkin, one of Smoque BBQ's owners with Tim Mikeska....................Long lines outside Smoque! Historic moment in Chicago's History! The first official Texas sausage wrap-a-round! sometimes called a bohemian foldover! Tim with Dr. Richard Garza Professor of Radiation Oncology Loyola University Medicine. © Copyright Mikeska Brands USA., 2010. All rights reserved.